The exhibition Vivienne Westwood, 1980-89 which opens March 8th, has been organized and curated by the graduate students of our program. 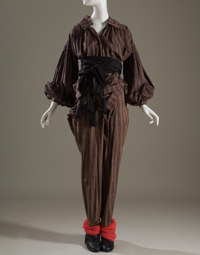 World’s End (Malcolm McLaren and Vivienne Westwood), unisex ensemble, multicolor striped cotton, Pirates collection, Fall 1981, England, gift of Barbara Hodes. Vivienne Westwood, 1980-89 is the first exhibition to examine Vivienne Westwood’s transformation from “street” provocateur to high-end fashion designer during the 1980s. Westwood began the decade outside the mainstream, as a designer of subcultural style, but as her work evolved so did her level of press coverage and the breadth of her clientele. By 1989, she was a celebrated vanguard in the fashion world. The magnitude of her remarkable rise was confirmed when she was named British Designer of the Year in both 1990 and 1991. The exhibition features garments drawn exclusively from the Museum at FIT’s permanent collection, as well as complementary photographs, magazines, and videos. Several looks from Westwood’s early years are being shown, including an ensemble from the influential Pirate collection of 1981. The slouchy, 18th-century inspired Pirate clothes could be worn by both men and women, and were a perfect fit for the post-punk aesthetic of the New Romantics. Westwood’s witty clothes in the early 1980s were produced in collaboration with her partner at the time, artist and music manager Malcolm McLaren. Their work was closely tied to the music scene, and the designs were worn by club kids and bands on MTV. 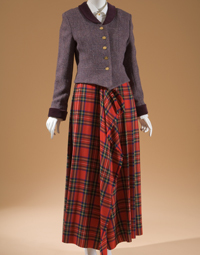 Vivienne Westwood, woman’s jacket and skirt ensemble, purple tweed, red tartan wool, white cotton, Time Machine collection, Fall 1988, England, museum purchase. The exhibition concludes with a never-before-exhibited menswear ensemble from the Civilizade collection (Spring/Summer 1989). A bi-colored knit ensemble, with articulated elbow- and kneepads, combined Westwood’s interest in medieval heraldry with padding that is usually associated with skateboarding. The outfit underscores Westwood’s ability to unite historical costume, street culture, and mainstream fashion—elements that continue to be relevant to her work today. 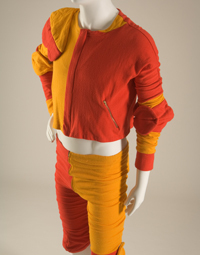 Vivienne Westwood, man’s two-piece ensemble, red and gold cotton jersey, Civilizade collection, spring 1989, England, museum purchase. 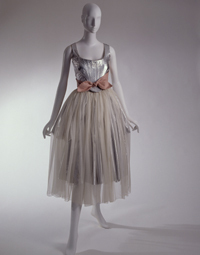 This entry was posted in Exhibition and tagged Malcolm McLaren, MFIT, Vivienne Westwood. Bookmark the permalink. J’ai le regret de ne pas pouvoir visiter l’exposition de Vivienne Westwood que j’aime.